When was the last time you turn on the radio and smiled as you heard your favorite song over the speakers? In fact, when was the last time that you felt any emotion that seems to be inspired by music? The average person listens 4 hours of music day. This is split between radio, streaming services like Spotify or Pandora and personally own music like CDs download podcasts and other things. Studies show that roughly 276 million Americans alone lessen the broadcasting radio every day. Another study in the UK funded by learning audio company discovered that the average person will spend roughly 13 years of their life, simply listening to music. Music has a very powerful effect on the human mind and you can even use it to your advantage. However, it is very important to keep in mind that there are two different sides of the coin of music. One side is, simply listening to music and then the other side is actually making music. Though not as larger the number of music listeners. The number of people that play an instrument in the U.S. is still enormous, 18 million! If you're not one of the 18 million Americans, they can play an instrument, don't worry was playing and listening has large benefits for increasing cognitive function. Listening to music can influence your mood and so I am certain that songs make you feel happy or sad or that might be a video for another time. However, the person listens to happy music and wants to feel happy they will find themselves feeling happier. In the same way, if they look into emotional or sad music and they want to feel sad they will find themselves feeling sadder. The key to remember here is that the person listening to the music must honestly desire to fuel certain way in order for the music to affect them. A person who is passively listening to a happy song and doesn't desire to feel happy as far less likely to feel emotional change the person who desires to be happy. Part of the reason for this ties into the well-known phrase mind-over-matter. This phrase is usually discredited as an artistic way to try harder. However, there is more than the thing than one might expect. For instance, scientists at Harvard performed a study on Tibetan Monks as they meditated. In the experiment wet sheets were placed around Monks their place in a really cool room 40 degrees Fahrenheit. Instead of shivering uncontrollably the monks began to exert an abnormal amount of body heat due to their meditation. It became so extreme that one of the researchers even notice steam rising from their wet sheets. There are many more examples of how your brain controls your body, infect, body language is one of the only things that you can fake it until you make it. However, the key is to remember that if you truly want to be happy while listening to your music you're likely to succeed. Further on that note when listening to music that you truly enjoy your body will release dopamine which is a feel-good neurochemical. This will chemically assist you in feeling happier. Also listening to music can also assist your neurological productivity in a fashion. A study was performed that established that a person listening to Mozart working was more productive in a person working in silence. The effect was named the Mozart Effect. However, it is not necessary that the music being listened to has to be Mozart or even classical music in general rather than it just being music that the listener enjoys. This means that if a person greatly enjoys listening to Johnny cash you can help them in the productivity if they listen to this music while working. However, it is absolutely key that the person is engaged in the music to reap the benefits. In other words, they must feel the music to be affected by. Simply having it on in the background will have little to no effect. Johnny Cash is easier skillet whatever you enjoy works. However, this brings up a new study that suggested that the music itself might not have an effect on a productive functionality of the brain. But, rather that had an effect on the emotional functions of the brain. This, in turn, has a positive effect on productivity regardless of the means the end was still the same. Listening to music and help a person be more productive at their work. Listening to music can also bring back memories both good and bad. This closely ties into the first method of how music affects the brain. As we go through life we attribute certain songs to certain events in our life for instance. Many people put together a breakup playlist during a difficult relationship with. At the time the songs maybe meant to help them process the emotions of the breakup but in the future, those songs will remind them of the emotions and memories they felt during that time. For the reason that these emotions can be attributed so strongly to a piece of music and is due to how auditory cortex stores sound. For instance the brain stores visual information a certain fashion due to the fact that a person can look over at something multiple times repetitively in a very short period of time. However, when hearing a sound you can only hear that sound once until your plate again at a later time. Think of the difference between listening to the radio and reading a magazine. The radio can only be heard once that a particular given time, whereas a magazine can be read repeatedly. Do this and the brain will develop the ability to hold onto a coke memory slightly longer or stronger than iconic memory. With that is the foundation of attaching auditory signals to memories it becomes less curious why emotional memories are so easily tied to the sound of music. Listening to music can give you the energy to work or work out longer and studies have shown their person who listens to specifically selected songs will perform much better at the task at hand. First is that the beat of the music of the pace for our bodies to match while working or working out. The faster the beat the faster the pace that we have consciously set for ourselves. The next reason takes us a bit deeper, music injuries our ears the vibrations are sent to our brain via electrical signals which are brains in translates into the sound of music. As our brain works sometimes with the music translating signals that receive them it's a pattern for the rest of your body. This includes heart rate, blood pressure, metabolic rate and even things like physical mental stress and fatigue. There are more ways than listening to music can affect the brain, however, now we are going to look at how playing music affects the brain. How does playing music affect the brain? Now it is common knowledge actually playing a musical instrument is beneficial to the brain as it grows and develops. 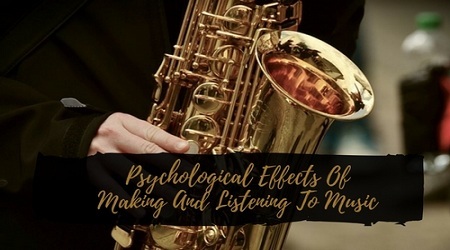 However, new studies have shown that it's not enough that a person simply takes some music lessons and learned how to play an instrument rather they must be engaged and interested in learning before the brain begins to show the effects. This means that the kid who sits at his or her desk and doodles all throughout band is not going to read the same benefits of the kid who is actively involved in the class. Therefore, the person wishes the reason benefits of playing an instrument you cannot just be an instrument must be what they are passionate about. Whether it's a young boy who wishes to learn how to play the harmonica for a teenage girl who deeply desires to learn the violin. As long as they're passionate about learning and enjoy the instrument it will benefit them enormously. In that regard, it also doesn't matter which instrument is played? A person who decides that they wish to play the drums may have the same or better benefits as a person who wishes to learn the piano. The key factor to learning an instrument is that the musician must appreciate the instrument of their learning, what are these benefits? Well, there's a number of ways of learning an instrument can aid the brain and its functions. Researchers at the auditory neuroscience laboratory and northwestern university discovered that the brain of a child who received a music question with capable of more refined reading skills. Early musical training can increase the brains elasticity. Learning an instrument has the capability of improving your motor skills and nearly every instrument requires the use of one specific muscle group or another. The majority of the time the learning of the answer will not only train those muscle groups but it will also assist the brain and learn how to control finer moments for the muscles of the body. A study from the Boston Children's Hospital discovered a possible link between the learning of an instrument in the brains executive functionality. Executive functions are the mental processes that allow the plan, focused on attention, remember instructions, multitask, quickly process information, solve problems, regulate our behaviors and adjust to changing mental demands. This is also something that is connected to meditation. In 2013 researchers conducted a study on how early music lessons affect the brain. The study showed that there were significant effects on the brain. If the lessons were taken within the six to eight-year range. The brains of these children had stronger connections between motor regions. What it means the cabinet sort of effect on the brain, well the answer that question was actually unknown until the 1990s, when the FMRI was created. Upon the invention of this machine, scientists discovered that music engaged and stimulated a vast amount of the brain in concordance with each other in a way that no other is practiced it. From the movement of the body which activates the motor cortex and cerebellum to the anticipation of flow and the tune of the song which activates the prefrontal cortex. Music woke up to bring unlike anything else no demand. So, it's important not to discredit music as an enjoyable pastime or Pleasant background noise it's a brilliant medium that can be used to help your everyday life. If you're struggling to study for an exam listening to music that you enjoy can help wake your brain up. If you're feeling sad on a certain day and want to feel better listening to some happy songs can lift your spirits. If you wish to improve your brain's ability to function in general picking up and learning an instrument will give your brain a noticeable boost. Finally, if you have a workout goal in mind but feel like you simply can't push through to success on the tune with a good beat will allow your body to match the pace and carry you through to the finish. These days music is never far from reach with smartphones and the Internet good tunes are accessible nearly everywhere at any time.